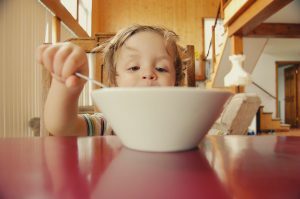 Toddlers can be fussy eaters who refuses to try a new food at least half of the time. Approximately half of all toddlers fit this description, so it is no wonder that food issues are a source of stress for parents. Establishing healthy eating patterns is important to avoid problems such as obesity and eating disorders later in life. Various strategies can help your child accept a wider range of foods. It may be necessary to offer a food to your child as many as 10 different times before they choose to eat it. The problem is, many parents get frustrated and give up before the fourth or fifth try. Try to make foods fun. Colorful foods like carrot sticks, raisins, apples, grapes, cheese sticks and crackers can all be fun and healthy choices for your growing toddler. Explain to them that eating good food is important so they’ll grow big and strong, and how it will help them run faster and play longer. Children learn behaviors from their parents. If you restrict yourself to a narrow range of foods, your child will take notice and mimic your caution. Don’t limit your child’s food variety to only those foods you prefer. It may be that your child’s tastes are different to yours, and perhaps you are simply serving them foods they don’t happen to like. Try to set a good example and try a variety of foods in front of your child. It could motivate them to do the same. If your child seems healthy and energetic, then they are eating enough. If you are still concerned, keep an eye on how much food they actually eat over the day. Children tend to graze constantly, rather than restrict their eating to three meals per day like adults. You may be surprised how those little handfuls and snacks add up. For further reassurance, check your child’s growth and weight charts, or check with your child’s pediatrician. Try not to worry, and remember, that unless a child is ill, they will eat. Children are very good at judging their hunger and fullness signals. Try to stay relaxed about mealtime and offer your child a wide variety of foods, and most importantly, remember to set a good example by trying a wide variety of foods yourself. You may discover you and your toddler share a new found favorite food!